BLOOMFIELD, Conn., Nov. 17 /CSRwire/ - With the release of its 2014 Cigna Connects Corporate Responsibility (CR) Report, global health service leader Cigna (NYSE:CI) highlighted how Cigna is working together with customers and all stakeholders to help build a more sustainable health care system. 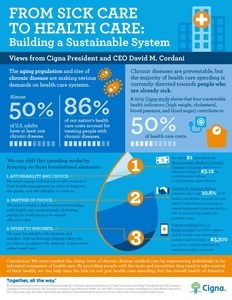 The report, available online at www.cigna.com/corporateresponsibility, links to the Health Care Leadership section of Cigna's website, outlining how Cigna is contributing to a health care system that delivers shared value to society. “As part of our mission to help improve the health, well-being and sense of security of those we serve, Cigna remains committed to health advocacy as a means of creating sustainable solutions for employers, improving the health of the individuals who the company serves, and lowering the costs of health care for all parties,” said Cigna President and CEO David M. Cordani. The report notes that while customer needs are changing, and health care systems in the U.S. and throughout the world are transforming in response, there is tremendous pressure on the system to improve affordability and, in many cases, to create more consumer choice as evolving demographics result in a different balance of needs. “At Cigna, we have strategically positioned our company to anticipate and adapt to these dynamic shifts. We've broken out of the traditional mode of being a health insurer focused on financing sick care, and transformed ourselves into a global health service company that focuses on health, wellness and preventive care, while providing customers with a sense of security,” Cordani said. Over the past five years, Cigna has continued to deliver industry leading medical cost trends that reflect better health outcomes, collaborative relationships with physicians, and sharp focus on personalization of care for customers. Cigna ended 2014 with 14.5 million global medical customers. Learn more about how Cigna is leading a national conversation on how to build a sustainable health care system in the Health Care Leadership section of Cigna's website. To share thoughts or questions, please contact cignaconnects@cigna.com.